"Together, we set out to combine the features, functionality and challenge of a Match-3 game with the story-line and humor of an animated feature so you can interact with these insanely cute pets before and even after watching the film." 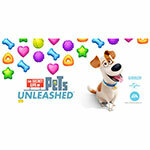 LOS ANGELES--(BUSINESS WIRE)--As movie-goers get ready for the highly anticipated release of Illumination Entertainment’s The Secret Life of Pets in theaters on July 8, game players can join the film’s characters, Max and his crew of charmingly mischievous companions, for an adventure in the Big Apple. Unlock new friends and colorful challenges in The Secret Life of Pets: Unleashed™ brought to you by Electronic Arts (NASDAQ:EA), Illumination Entertainment, and NBCUniversal Brand Development, available now as a free* download on the App Store and Google Play. Match their way through New York with the charming guide Max revealing new puzzles, pets and moments along the way. Players will get to chase away pesky squirrels with Mel or dig up super-sized bones for Duke. As players progress through the game and make their way to the top of the leaderboards, they’ll meet new pets including Chloe, who can't be bothered unless there is food, Leonard, the posh punk poodle and Snowball, the insanely cute and also insane rabbit. Grab your pet and join us in real life at The Grove in Los Angeles on June 29th from 11 AM PST to 5 PM PST for a day of My Dog and Me Match 3 games, prizes and more. For more information about The Secret Life of Pets: Unleashed, please visit http://www.thesecretlifeofpetsgame.com/, follow us on Twitter or Like us on Facebook. lllumination Entertainment, founded by Chris Meledandri in 2007, is one of the entertainment industry’s leading producers of event animated films. Illumination, which has an exclusive financing and distribution partnership with Universal Pictures, is the creator of the hugely successful DESPICABLE ME franchise, which includes MINIONS, the second-highest-grossing animated film of all time as well as DESPICABLE ME 2, an Academy Award nominee for Best Animated Feature of 2013. In all, Illumination’s films, which also include 2011’s HOP and 2012’s Dr. Seuss’ THE LORAX, have grossed more than $3.2 billion in worldwide box-office revenues and feature some of the world's most renowned talent. Upcoming films, in addition to The Secret Life of Pets include SING, which arrives in theaters in December 2016, starring Matthew McConaughey, Reese Witherspoon, Seth MacFarlane, Scarlett Johansson, John C. Reilly, Taron Egerton and Tori Kelly; DESPICABLE ME 3, starring Steve Carell and Trey Parker which is set for June 2017; and a newly-imagined version of Dr. Seuss’ HOW THE GRINCH STOLE CHRISTMAS, starring Benedict Cumberbatch in the title role of The Grinch, that is set for November 2018. In addition, Minion Rush (750 million downloads) has become one of the world’s most popular apps, and Minion Mayhem attracts huge crowds at Universal Orlando Resort and Universal Studios Hollywood. NBCUniversal Brand Development (NBCUBD) drives expansion of the company’s intellectual properties, franchises, characters and stories through innovative physical and digital products, kids and family content, and consumer experiences globally. Along with franchise brand management, NBCUBD includes three lines of business: NBCUniversal Consumer Products, Universal Kids & Family Productions, and NBCUniversal Games and Digital Products. NBCUniversal Brand Development is a business segment of Universal Filmed Entertainment Group, and part of NBCUniversal, a subsidiary of Comcast Corporation. THE SECRET LIFE OF PETS: UNLEASHED, PETS UNLEASHED, THE SECRET LIFE OF PETS and all related marks and logos are trademarks of Universal Studios. © 2016 Universal Studios. Licensed by Universal Studios Licensing LLC. All Rights Reserved.